There was never a 4th of July parade in Stanardsville when I was growing up but my parents often spoke of going to a 4th of July celebration in Stanardsville as children. They described it as a day for all the community to come to town to visit and fellowship with each other. Children saved all of their pennies so they could buy ice cream cones and there would also be lots of minor, “firecrackers,” as my Dad called them. When I retired from teaching in the Spotsylvania County School System, I returned to Stanardsville—my home town. My elderly father looked forward to the 4th of July each year and we always went to one local parade or another—Scottsville, Crozet or McIntire Park. These trips were hard on him and though he enjoyed them a great deal, he never stopped talking about going to the 4th of July in Stanardsville. 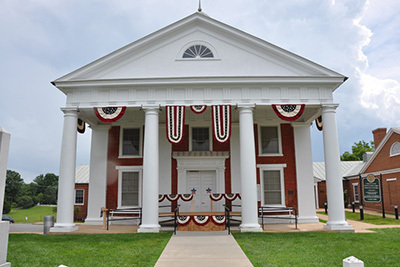 Finally, after a particularly hot and sticky 4th of July spent in Scottsville in 2002, I decided that the next year there would be a 4th of July celebration in Stanardsville. I had just become a member of the Historical Society and I asked the board if they would sponsor Stanardsville 4th of July Parade. They agreed and 2003 saw the return of an old tradition and the beginning of a new one! The first three years 4th of July Celebration consisted of a walking units parade only. The Historical Society decorated the town with patriotic bunting. Children were encouraged to decorate their wagons with patriotic themes while their parents dressed in red, white and blue for the occasion and carried posters and signs with patriotic messages. Civic groups and churches joined in making for a fun time. Starting in the parking lot behind the Court House at 10:15 AM, the parade walked around the Court Square twice after which the community enjoyed music by local musicians, enjoyed walking tours of the town, Dookie’s Cabin-Museum of Natural History was opened to the community and short patriotic speeches were given by representatives of the Democrat and Republican Parties. It was, as my father recalled from his youth, an opportunity for the town to come together. After the third year, Margaret Hope expanded the parade with floats and a parade route down Main Street and with each successive year we grew the parade. After a while, I decided that I needed to turn this event over to someone else. So, when the parade grew to over 50 entries in 2014, I stepped aside and handed the reigns over to Michael Payne who has continued the traditions of growth and community togetherness. In 2015, the 4th of July Parade added a community celebration to the end of the parade to encourage folks to stay longer and fellowship. In 2016, the event added hot air balloons, cannons and an evening program consisting of two wonderful local bands and the first ever community fireworks display. In 2017, a car show was added and the fireworks display became even more impressive. I remain an involved member of the Stanardsville Independence Day Committee and I have been very pleased to see the Red, White, Blue ‘n Greene grow into a main county event.